Find incredible autumn savings on Cancun, Montego Bay, Tampa, Montreal, Toronto, Puerto Vallarta, Maui, Kauai, Edmonton, Kelowna and more! Don’t miss out. 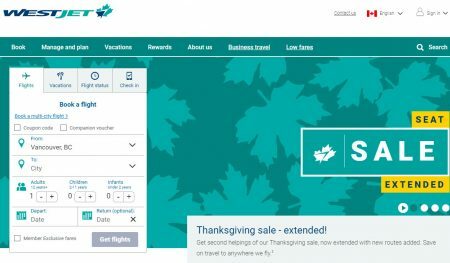 WestJet has extended their Thanksgiving Seat Sale. The sale was to originally end on Oct 4th – it’s been extended to Oct 9th to match Air Canada’s seat sale. Get second helpings of our Thanksgiving sale, now extended with new routes added. Looking for deals on fall and winter travel? Save on flights to great destinations in Canada, the U.S., Mexico and the Caribbean. Lowest fares for travel to the U.S., Mexico, and the Caribbean can be found on Tuesdays and Wednesdays. 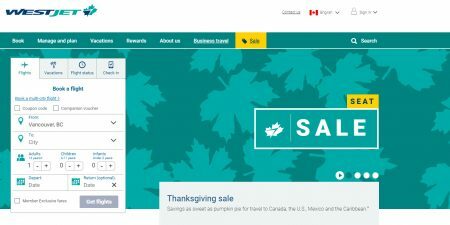 Air Canada is having a Thanksgivng Seat Sale. 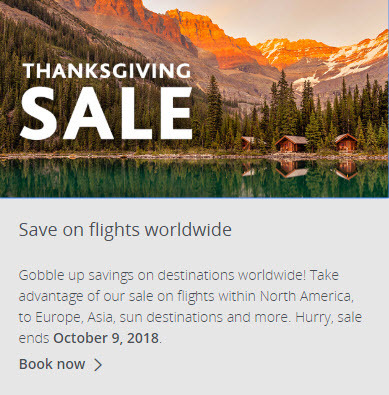 Gobble up savings on destinations worldwide! Take advantage of Air Canada’s seat sale on flights within North America, to Europe, Asia, sun destinations and more. Sale ends Tuesday, October 9, 2018 at 11:59pm MDT. WestJet is having a Thanksgiving Seat Sale. For travel to Canada, and the U.S., no blackout dates apply. For travel to Mexico and the Caribbean, blackout dates are December 19-24, 26-31, 2018 and January 1-6, February 14-16, 18 & April 18-20, 22, 2019. 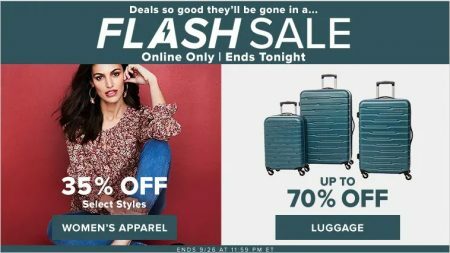 Hudson’s Bay is having a 1-day only Flash Sale today (Wednesday, September 26, 2018). This offer is valid on Economy class (Basic and Standard) base fares. Hurry, offer ends September 26, 2018. Valid on Economy (Basic and Standard) base fares. Travel valid from October 10, 2018 until December 19, 2018. 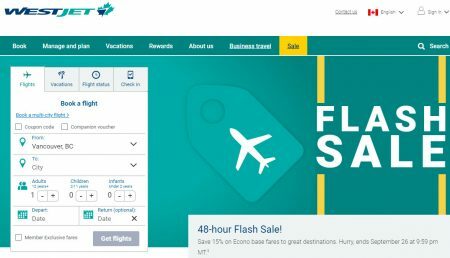 WestJet is having a 48-Hour Flash Sale. Save 15% off Econo Base Fares to Canada, the U.S., Mexico and the Caribbean. Hurry, offer ends on Wednesday, September 26, 2018 at 9:59pm MT. Offer destinations: This offer is valid on WestJet flights to Canada, the U.S., Mexico and the Caribbean. WestJet is having a 1-day only Flash Sale. 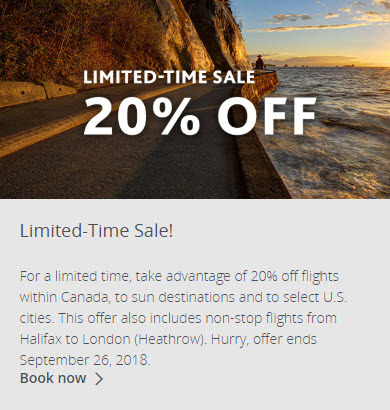 Today only, save on your fall getaway with 20% off Econo (Lowest), Econo and Plus (Lowest) base fares anywhere WestJet flies – hurry, a deal this good won’t last long! Hurry, offer ends tonight (Tuesday, September 18, 2018 at 9:59pm MT). This offer is valid on: WestJet flights anywhere we fly. 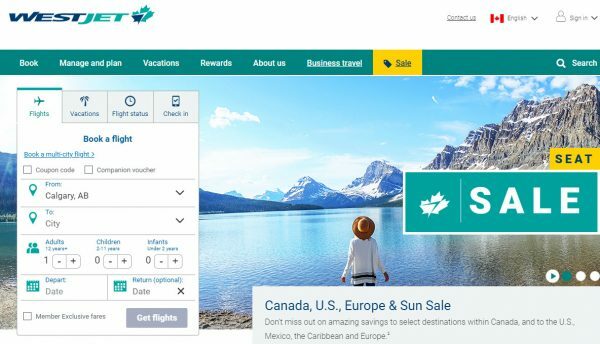 WestJet is having a Canada, U.S., Europe & Sun Seat Sale. Take advantage of amazing savings on your next getaway to a wide selection of destinations in Canada, U.S., Mexico, the Caribbean and Europe. Hurry, before time runs out!